After she received the stigmata, Judith von Halle began vividly to perceive the events that occurred at the time of Christ. These continuing experiences are not visions, but rather an actual participation - involving all human senses - in the events themselves. To complement this personal witnessing of Christ's life, von Halle has researched the facts using spiritual-scientific methods, based on a fully conscious crossing of the spiritual threshold by the human 'I'. 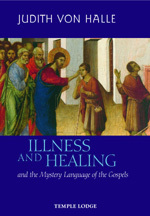 Combining the results, she explores here, in her continuing series "Approaches to Understanding the Christ Event", the nature of illnesses at the time of Christ as described in the Gospels, and how He set about healing them. The Gospels conceal untapped treasures which can only be brought to light by deciphering their inherently pictorial language. By developing a spiritual-scientific mode of thinking we can create the foundation for examining the causes and cures of illness. The author explains the meaning of certain phrases and passages in the Gospels, translating them from their metaphorical form into modern language. She also reveals why illnesses at the time of Christ were different from medical disorders of today, and studies the nature and causes of modern illnesses.